This very popular ages 5 to 7 Sr. Tiger program teaches a progressive and fun curriculum. An accredited program with the Traditional Tang Soo Do Federation (TTF), children learn the basics of martial arts and the importance of self-control, self-discipline and respect in every class. They must demonstrate the best Sr. Tiger Etiquette: listen to Mom and Dad, behave at school, complete homework assignments, help out with chores at home with a positive attitude and more. Our Sr. Tigers know that they must do all of this to be considered for their next belt test. Sr. Tigers practice flying kicks, obstacle courses and SAQ(tm) (Speed Agility and Quickness) drills at each class. Here you will find that children are encouraged to do their very best in a positive environment. Tournament competitions are also available for this age group. Although not required to advance to their next belt level, we highly encourage participation so that they can learn how to: 1. Speak/announce in front of large crowd of strangers. 2. Win or lose graciously 3. Strengthen and focus on areas for improvement. 3. Make lifetime friends from all over the world. Sr. Tiger classes are held 2 times a day most days. Choose the class times and days that are right for you. We recommend that Sr. Tigers come to class at least 2 times a week to progress in their belts. If your schedule of other activities are temporarily full for the week, you can also come 1 time a week. We also have an option of unlimited classes per week for your martial artist. Stop by anytime to watch a class. You can also schedule a private assessment by filling out this form. 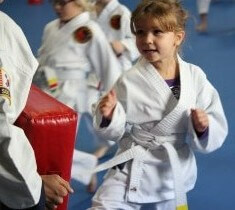 Grab our $29 Spring Deal for 1 week of consecutive martial arts training. Receive a free uniform when you sign up as a regular AKMA Student. Parents please note: We accepting children starting at 4.5 year’s of age by invitation only. Call Do Jang for details. Tell Me More About Your Sr. Tiger Program! We can schedule an appointment for you today. Call us at 760-828-7165 or fill out this form. We will get back to you asap.